Daniel Whitenack is writing on the Svbtle network. I’m super pumped that my new book Machine Learning with Go is now available! Writing the book allowed me to get a complete view of the current state of machine learning in Go, and let’s just say that I’m pretty excited to see how the community growing! In the book (and for my own edification), I decided that I would build a neural network from scratch in Go. Turns out, this is fairly easy, and I thought it would be great to share my little neural net here. All the code and data shown below is available on GitHub. No cgo - I want my little neural net to compile nicely to a statically linked binary, and I also want to highlight the numerical functionality that is available natively in Go. gonum matrix input - I want supply matrices to my neural network for training, similar to how you would supply numpy arrays to most Python machine learning functions. Variable numbers of nodes - Although I will only illustrate one architecture here, I wanted my code to be flexible, such that I could tweak the numbers of nodes in each layer for other scenarios. 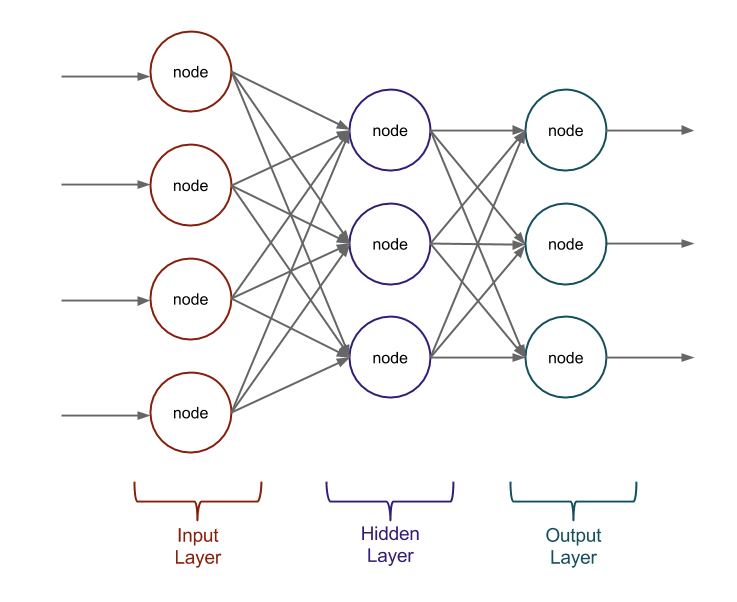 This type of single layer neural net might not be very “deep,” but it has proven to be very useful for a huge majority of simple classification tasks. In our case, we will be training our model to classify iris flowers based on the famous iris flower dataset. This should be more than enough to solve that problem with a high degree of accuracy. Each of the nodes in the network will take in one or more inputs, combine those together linearly (using weights and a bias), and then apply a non-linear activation function. By optimizing the weights and the biases, with a process called backpropagation, we will be able to mimic the relationships between our inputs (measurements of flowers) and what we are trying to predict (species of flowers). We will then be able to feed new inputs through the optimized network (i.e., we will feed them forward) to predict the corresponding output. // that defines a trained neural network. // architecture and learning parameters. // newNetwork initializes a new neural network. We also need to define our activation function and it’s derivative, which we will utilize during backpropagation. There are many choices for activation functions, but here we are going to use the sigmoid function. This function has various advantages, including probabilistic interpretations and a convenient expression for it’s derivative. // for use in activation functions. // of the sigmoid function for backpropagation. Initializing our weights and biases (e.g., randomly). Feeding training data through the neural net forward to produce output. Comparing the output to the correct output to get errors. Calculating changes to our weights and biases based on the errors. Propagating the changes back through the network. Repeating steps 2-5 for a given number of epochs or until a stopping criteria is satisfied. In steps 3-5, we will utilize stochastic gradient descent (SGD) to determine the updates for our weights and biases. To implement this network training, I created a method on neuralNet that would take pointers to two matrices as input, x and y. x will be the features of our data set (i.e., the independent variables) and y will represent what we are trying to predict (i.e., the dependent variable). I will show an example of these later in the article, but for now, let’s assume that they take this form. // train trains a neural network using backpropagation. // Define the output of the neural network. // Use backpropagation to adjust the weights and biases. // Define our trained neural network. The actual implementation of backpropagation is shown below. Note/Warning, for clarity and simplicity, I’m going to create a handful of matrices as I carry out the backpropagation. For large data sets, you would likely want to optimize this to reduce the number of matrices in memory. // backpropagate completes the backpropagation method. // backpropagation to train our model. // Complete the feed forward process. // preserving the other dimension. After training our neural net, we are going to want to use it to make predictions. To do this, we just need to feed some given x values forward through the network to produce an output. This looks similar to the first part of backpropagation. Except, here we are going to return the generated output. // represents a trained model. Ok, we now have the building blocks that we will need to train and test our neural network. However, before we go off and try to run this, let’s take a brief look at the data that I will be using to experiment with this neural net. I also split the data set up for training and testing (via an 80/20 split) into train.csv and test.csv respectively. // Open the training dataset file. // Create a new CSV reader reading from the opened file. // used to form our matrices. // Sequentially move the rows into a slice of floats. // Skip the header row. // Loop over the float columns. // Convert the value to a float. // Add to the labelsData if relevant. // Add the float value to the slice of floats. // Train the neural network. // Training as shown above. // Parsing the test data into testInputs and testLabels. // Make the predictions using the trained model. // Calculate the accuracy of our model. // Accumulate the true positive/negative count. // Calculate the accuracy (subset accuracy). // Output the Accuracy value to standard out. Woohoo! 97% accuracy isn’t too shabby for our little from scratch neural net! Of course this number will vary due to the randomness in the model, but it does generally perform very nicely.